Zara jeans; Madewell sweater (old); Nordstrom faux fur vest (old, similar from Calvin Klein); vintage scarf; Ray-Ban aviators; American Apparel deep V tee; unknown oxfords; NARS heat wave lipstick. Since I last checked in on the ol' blog, a lot has happened, and I'm so sorry I've been so bad at updating lately. The power is back on in lower Manhattan and things on the island have more-or-less returned to normal. We had a wild Nor'easter storm called Athena roll into town on Wednesday and leave us with a bit of snow, that promptly melted. It was sort of a wild week of playing catch-up in the office, hence the lack of posting here. Anyway, camo jeans! I picked these up at Zara a few weeks ago, and I've gotten a lot of wear out of them since. They're an interesting fit, cropped and skinny with a lower rise and very little stretch (aka if they don't fit when you try them on, don't bother). They're almost velvet-y soft though, and have been really fun to style. At about $70, the price point is accessible, and they satisfy my fix for skinny camo jeans, but I still lust for the Textile Elizabeth & James version. For work today on a sunny, chilly Friday, I opted to pair them with my favorite Madewell cable knit sweater and faux fur vest, both from last season. I hope to be back to regular posting next week, and hope you all have a fantastic weekend. when can i come over and borrow these???? So everything about this outfit is pretty baller! Yeah, I said baller but I'm from Ohio and we may be a bit behind the times. Those camo jeans are great. Zara pants never fit me sadly, but those make me want to give them another try! Those jeans look awesome on you! Really. . .they look like they were made for you. 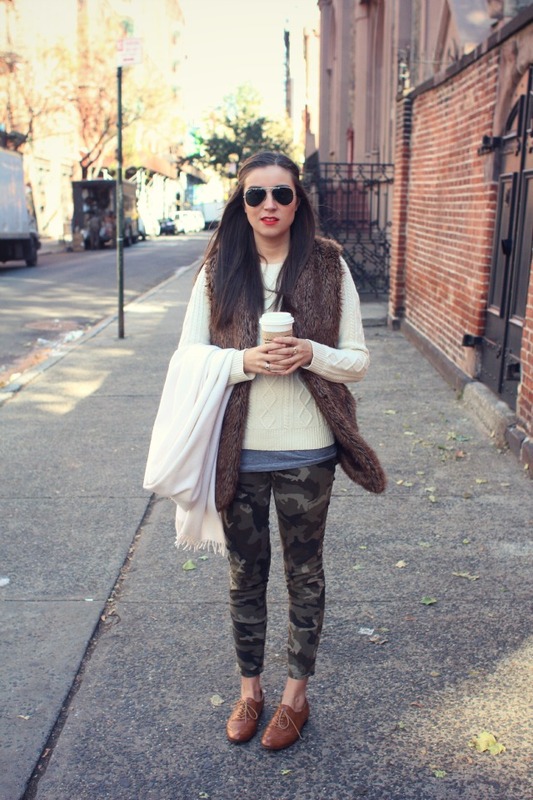 I just love camo print, and it's really fun on pants. Love how you styled them!